What are the special interior features of Porsche 911? 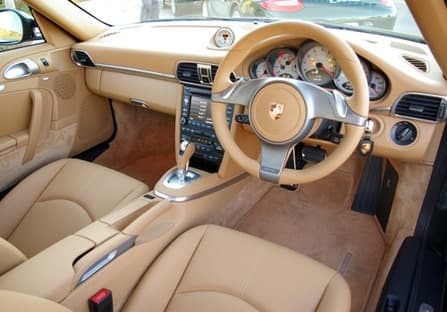 Porsche identity on inside is revealed by ascending center console.The distance between gear lever and selector and steering wheel is extremely short and operating logic such as that of the two zone air conditioning system or the suspension settings is clear and un complicated. The high quality sporty materials are used for every unit. Alcantara leather is used for steering wheel rim, door pulls and armrests. There is wide range of personolisation choice available including black, platinum grey,luxor beige,and yachting blue for interiors. CDR audio system with 7 inch colour screen and sound package system offer great performance with 235 watts power. I love the interior and the exterior appearance of my new Porche 911 Turbo Cabriolet. I bought it in grey colour and it looks fabulous. The seats and the power steering are made of upholstery leather. It has standard AC, automatic climate and air quality control. Adjustable steering column, electronic multi – trip meter, tachometer and digital clock and odometer are some of its amazing features. It is comfortable and luxurious. The car is spacious and convenient from the inside. It has adjustable seats, rear parking sensors, amazing CD and DVD player with USB and Aux-In Radio. Porsche 911 Turbo Cabriolet is technologically updated with having low fuel warning light, power steering, fuel lid opener outlet, smart access key, navigation system and vanity mirror. All these features on the interiors make the drive extremely smooth and relaxed.